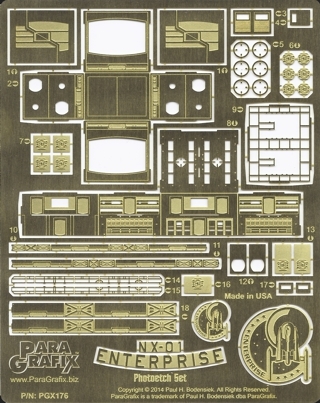 Super-detail the giant 1/350 scale NX-01 Enterprise kit from Polar Lights. Minutely detailed airlock hatches scaled directly from the original CG (computer graphics) model. Docking rings for all appropriate airlocks. Easily lit* windows for the hangar bay control room. Shuttlepod hangar bay that matches the original studio set including railings, ceiling lighting, and lightable control panels. Conceptual cargo bay with interior cargo doors that can be displayed open or closed. All folding can be accomplished without the need for a bending tool.